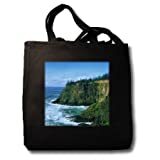 Digital Oil Painting Oregon coast High cliffs pounding waves ocean Tote Bag is commercial quality high resolution heat transfer product. This versatile tote bag is perfect for school, errands, or trips to the beach. Comes with 12-ounce cotton twill, cotton web handles.